Prime Private Lake Michigan Waterfront!!! Good Harbor Bay Estate is located just 3 miles south of historic Leland with direct frontage on America's most beautiful beach (Good Morning America 2012). The white sandy beach stretches into 37 miles of Sleeping Bear National Park, with ample opportunity for hiking, swimming, kayaking, paddle boarding and eagle sightings. 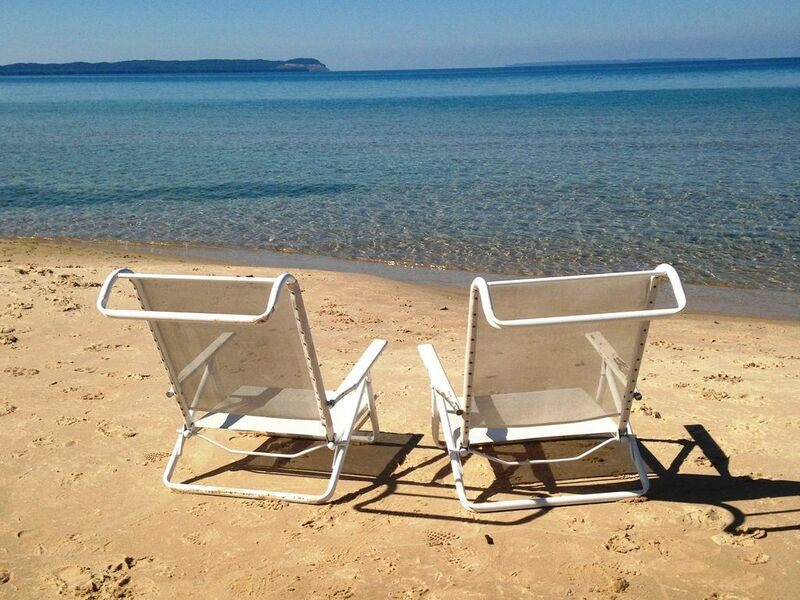 It has breathtaking sunset views of both South and North Manitou islands as well as Pyramid Point. Right across from the lighthouse (crib) between the Manitou islands. The estate has gorgeous private Lake Michigan water frontage and is the perfect setting for large family gatherings as well as small romantic getaways and special anniversaries. It includes 5 bedrooms, 3.5 bath, private TV Room, cathedral ceiling living room with large fireplace, dining room/wet bar, stainless steel gourmet kitchen with wine cooler, a wonderful screened porch, upper and lower decks, outdoor shower, lower level play room/gym. The estate has free wireless high-speed internet, cable TV and free nationwide calling. The spectacular sunsets and awesome views all the way from Pyramid Point to Whaleback along with the sandy beach invite you to use our kayaks and stand-up paddle boards (both included), make a campfire by the beach or simply sit, rejuvenate and enjoy this peaceful setting. While the Estate is nestled into a very secluded frontage, it is in close proximity to restaurants, historic sites, the Traverse City Film fest, golfing and shopping. Leelanau County is known for its extensive and beautiful road-biking routes, wine-tours, boating and hiking. Sorry, absolutely no smoking please. Not zoned for weddings. Find goodharborbayestate in the web for more information. Sunset views of Manitou Islands, as well as Pyramid point. Wood fireplace in living-room. Wood for fire-place as well as beach-bonfires provided. Our 2 kayaks as well as 2 stand-up paddle boards are at the beach and we are happy to share with you anytime. We are absolutely LOVE this place from the house, the view & all the details the owners have put in this place. Unlike other rental vacation homes that guests have to bring their own everything, the owners prepare lots of towels, toilet paper, household cleaning supplies, etc. Best hospitality! We will be going back year after year. Thank you Arndt and Tanja for everything. I highly recommend this place if you are looking for peace & serenity. The view of Lake Michigan is stunning. The home faces N. and S. Manitou Islands, and the Lighthouse that sits in between. The home is spacious and spotless. Furnishings include anything you'd need for a great stay. We stayed in winter, and therefore did not enjoy the beach (other than a bit of ice exploration), but we did enjoy the wood burning stove and the hospitality of the host. Highly recommended! When I searched for a house in the Leelanau I chuckled when I read a review noting "good toilet paper" but this comment and her full review was what made me initially choose this home and she was correct. The owners' attention to detail and their commitment to providing the best experience sets this property apart. As we pulled in the drive on a chilly November evening the house glowed with warm light spilling from every window and through the front door a blazing fire in the fireplace could be seen.....an absolutely perfect welcome and a sign that we had indeed made the right choice. The location is stunning, steps from Lake Michigan with beautiful views from every window. The house is large, well laid out and absolutely immaculate. Tastefully decorated with local art on the walls, just enough seasonal decoration and some interesting vintage pieces. The kitchen is well appointed with full sets of dishes, flatware and glasses. Cabinets stocked with cookware, bowls and utensils to prepare a meal from a simple snack to gourmet dinner. Plenty of big, fluffy bath towels and soft bed linens that smelled so good you just wanted to bury your face in the pillows (We will confess to sniffing the detergent and fabric sheets in the laundry room trying to track down the source of this scent!!). And the little extras that make the difference: emails/texts were answered promptly, completely and personably; wine waiting for us when we arrived; a bowl of K cups for morning coffee. The owner even shoveled the snow on the walkway so we could pack the car the morning of our departure. Everything about this property is five stars. Where to begin! This is not your typical rental property. We immediately felt comfortable, like we were staying in someone's home not a rental property. We have rented a vacation house for approximately 6 years and this is by far the most perfect home for our family. The home was impeccably clean, had just about any amenity you needed and the owners were very accommodating! Of course my parents got there early and Arndt was so gracious to allow them in ahead of time. Even arriving early, the place was still spotless and we are a picky bunch of folks! There really aren't enough positive things I can say about this place. Location was lovely for us; we've only stayed in this part of the area once before. All in all, this was one of our best vacations yet. So, thank you again Tanja and Arndt for sharing this amazing home with the world! We have rented vacation houses all over the country. I believe this is the first time that the house was exactly like they said it would be, and much more. This may sound petty but little things like nice toilet paper, dozens of really nice beach towels, lots of nice bath towels, laundry detergent, lots of dinnerware, plenty of seating; indoor and out, great outdoor recreation items, propane in the grill, everything you need for a bonfire, etc. I'm citing these specific amenities because I have experienced NOT having them at one house or another. Then there are the sunsets!!! All around great house. Owners are very nice people, too. We spent a week in August (2018) at this fabulous vacation rental. The moment your car crunches onto the pelleted and smooth rock driveway of Good Harbor Bay Estate, you feel a wave of peace wash over you. Then you step into the airy and crisp cottage from the front door and look beyond the bright kitchen, further beyond the fresh-cut flowers in a vase in the living room, out through the long and clear glass windows flanking the fireplace, and onto the cerulean blue waters of Lake Michigan. It's then that you sigh a breath of relief. From the hopeful and expectant journey it took to arrive, you are immediately retreating to the now backwards counting of time of when you must depart. But oh those hundreds of thousands of seconds you spend here are magical. The owners have done a 5-star job of greeting you upon arrival; having every need met, thoroughly communicating expectations, and cheerfully understanding yours. The relationship is symbiotic; providing a balance that can only be achieved by working together. And they work hard at it. From someone who is also in the vacation rental business, I give Tonja and Arndt a 10 out of 5 stars. *The extremely comfortable master bedroom mattress. *The lake views from 4 of the 5 bedrooms. *The nightly sunsets over Lake Michigan between North and South Manitou Islands. *Opening the blinds in the basement bedroom and watching the sun set while putting the younger children to bed. *The well-stocked and supplied kitchen and multiple dining areas. *The access to recreation in the basement with the ping pong table, darts, puzzles, toys, games, and more. *The airy and breezy library shelving upstairs. Choosing a book from numerous titles ranging from fiction to non-fiction, from children to adults, from self-help to even several local authors. *The well-lit and maintained wooden stairs and multiple outdoor living areas to the private beach of Good Harbor Bay. *The granted access and usage of outdoor activities; stand up paddle board, kayaking, beach chairs, and even life vests. It makes packing for a trip Up North so much easier. *The extra beach towels and the fully stocked laundry room just inside of the outdoor shower/rinse off area. *And lastly, the abundant Petoskey stones. This is a place for all seasons of the year. And for all seasons in one's life. From the very young to simply the youngest at heart.